After I showed off that 5/5 mini yesterday, I thought about some of the other minis from 2015. 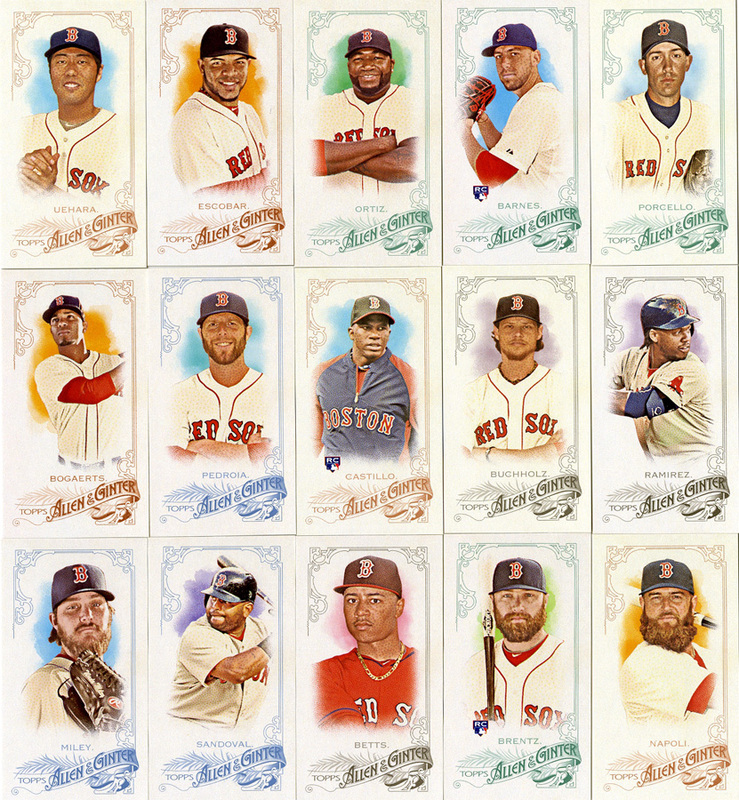 Then I realized I had no idea if I had finished collecting the Ginter or GQ minis this year. I’ve been terrible about keeping track. 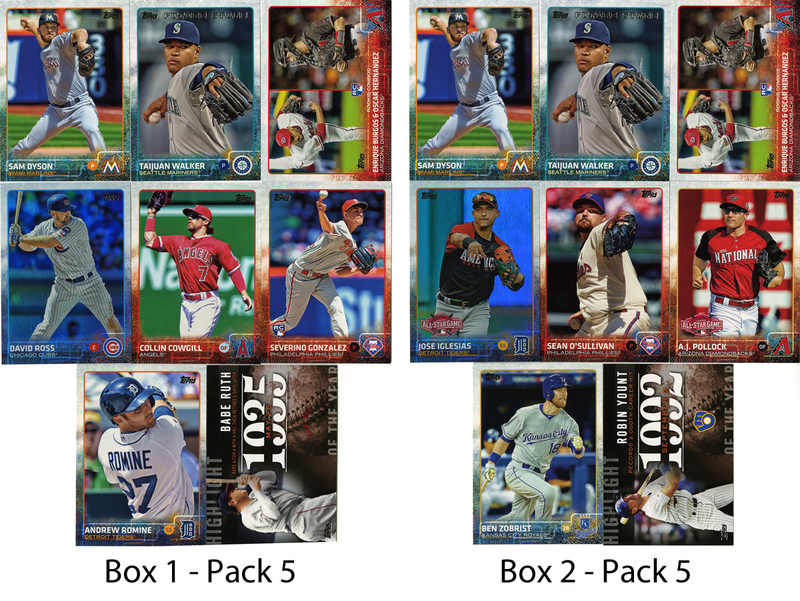 I have no lists of cards I need for the past year and a half or so. Thankfully, I did have the sense to at least put most of them in binder pages, so it was just a matter of checking. Now that’s a nice looking page. I’m not really sold on the different colors for the borders for this year. Some work, but some don’t, especially that weird red-brown. I’m also not really sure why they chose that photo for Mookie Betts, it looks completely out of place. Other than that it’s a pretty solid group of minis. 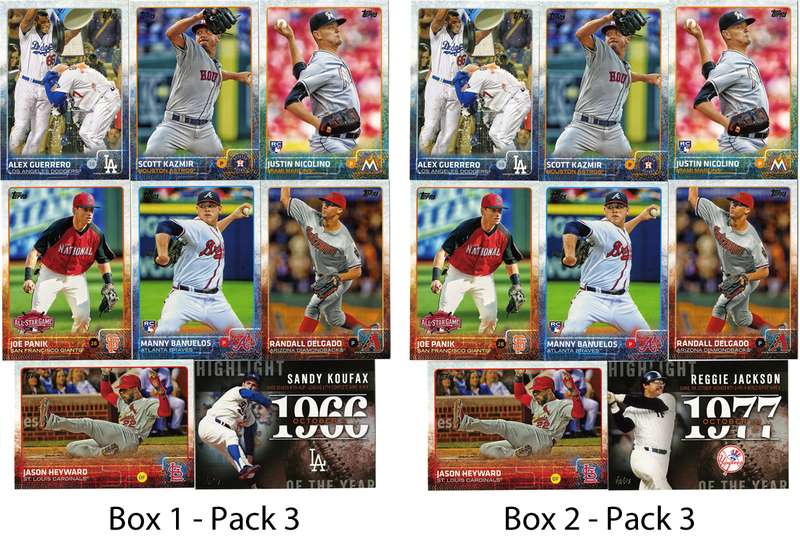 According to the checklist I just need the Shane Victorino SP, which I’m not too terribly concerned about. I’m sure it’ll cross my path at some point. Now that’s a sick mini. In case you’re wondering, it’s like half and inch thick so that the relic has room to fit inside. That also makes it nearly impossible to store in anything, but it’s a small price to pay for awesomeness. 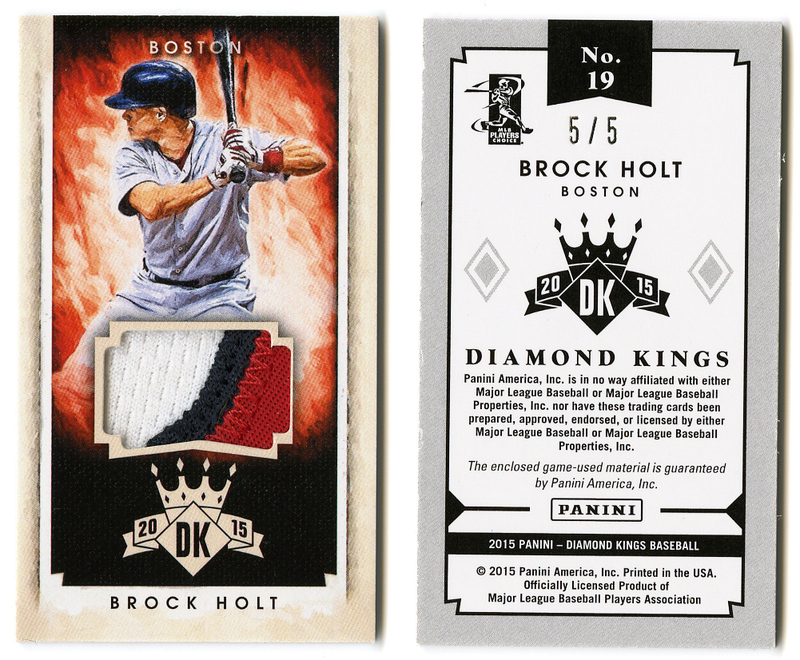 I have many Brock Holt cards, but this one is pretty high up there on my list of favorites. 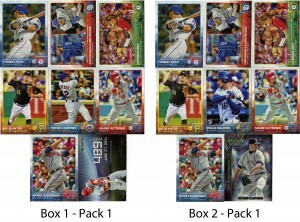 I was fairly vocal last year about my disdain for Topps Chrome. I didn’t buy any, I didn’t like it, I was just done with that whole product. I remember having lunch with Sam back in September and discussing Chrome in general and how this year, allegedly, retail was “loaded” and that (factually, not just allegedly) they had moved some of the harder to find colored parallels out of Hobby and into Retail boxes. I mentioned the other day how I had some really terrible luck with retail boxes. I nearly swore off retail buying entirely after that fiasco and it wasn’t until a trip right before Christmas that I decided to buy anything again. I had become enamored with those chrome sparkle parallels. I was having bad luck finding a Brock Holt gold parallel and I saw one little blaster and decided to try my luck. It’s a good thing I did. There’s several posts I’ve got lined up that deal with buying retail. It’s my closest option, it’s my only option if I want to buy something in person. 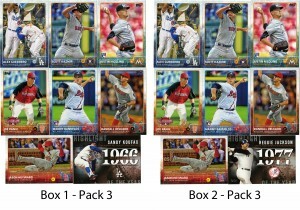 In two of these posts I’m going to actually (hold on to something) give Topps praise for doing something right. This is not that post. This post is to illustrate when things go very very wrong. Again, completely oblivious. 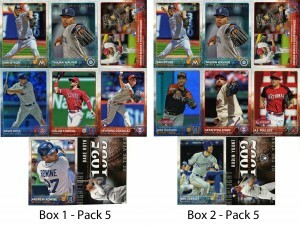 I’m excited I got an extra Pederson RC, and more Todd Frazier and Jose Altuve are always good. 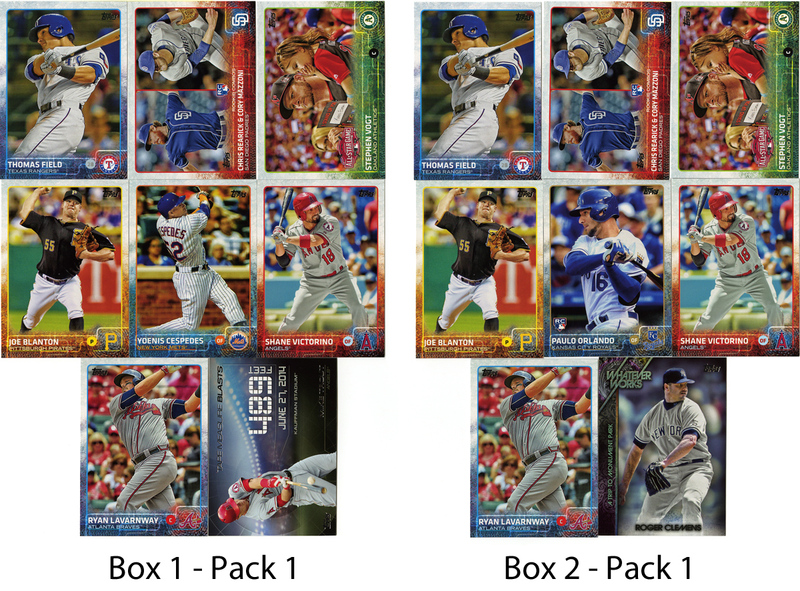 While both packs had a couple of different cards, the fact that the rainbow foil parallel fell in EXACTLY the same spot, in the same pack, in the same card order was a little too much. 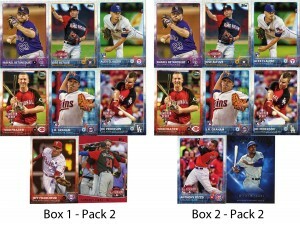 It’s just like buying a hobby box and knowing that the bottom pack on the right has the auto in it. Again, mechanical process, the machine is making the packs, I get it. I know there isn’t a human being putting packs into boxes in a specific order just to mess with me. Then again, maybe there should be. 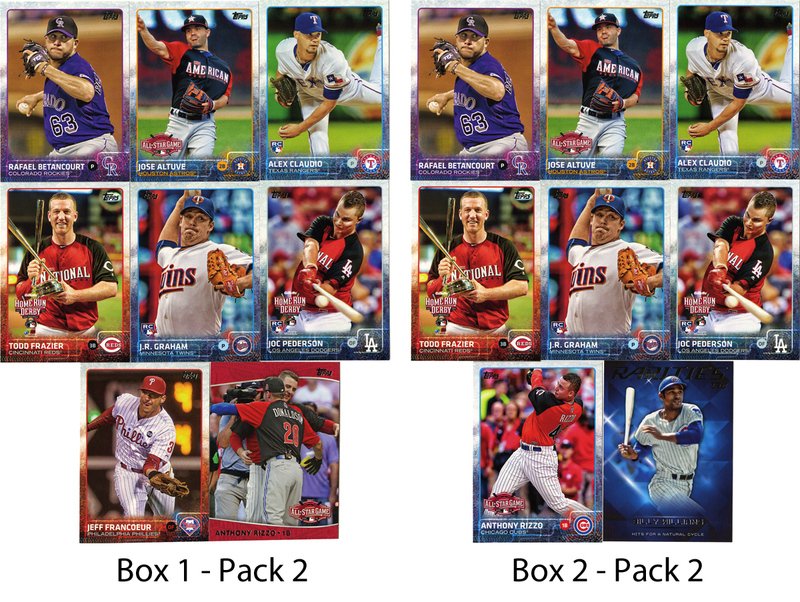 Maybe all the packs should convalesce in a big pile and non-machine workers should put them into boxes randomly. That’s probably too much to ask. I consider it a good lesson learned. Never buy two boxes from the same shelf or shipment on the same day. I would shake my fist at Topps and tell them this is unacceptable, but I’m pretty sure they stopped caring at some point in the 1980’s.